Dustin O'Hara, DANM '11, living in London, has been working over the past eight months on a project called "Me You Hoxton Too." Commissioned by a gallery in Hoxton (the neighborhood where Dustin lives) called PEER, the project was centered around exploring the neighborhood with local residents and listening to their stories about the area. The project was developed in partnership with a group called Access All Areas. Access All Areas is a theater company that works with local residents with severe learning disabilities. The workshop group met for weekly meetings, and during those meetings they were led on walks around the neighborhood by other residents. In addition to these earlier 'research' walks, some sit down interviews with older residents were conducted, and a public booth for collecting/exchanging stories was set up on the main road, Hoxton Street. Now Dustin is about to embark on a grant, The Shoredtich Park Project, which is an oral history project that is thematically focused on the a neighborhood of prefabricated homes that once stood in what is now a beautiful neighborhood park, across the street from his flat. The 'prefab home' is an architectural expression of a much larger (socialist) campaign to build the nation back up directly after WWII. The prefabs were often referred to as "homes for heroes." This particular neighborhood was previously filled with Victorian era terrace housing, but during WWII it was bombed. After the war, a neighborhood of prefab homes were put up while permanent housing was built nearby. His housing estate is one of the housing projects that was built, and by the early 70s the prefab homes were cleared out and the area opened as a park. He'll be working with a group of youth from the estate, meeting with them for regular weekly workshop meetings. The kids will learn a bunch of media, oral history, and archival skills, as they interview local senior citizens. The project is described as a "cross generational" collaboration. The Shoredtich Park Project is in partnership with the Hackney Museum and the Hackney Archive (Hackney is the East London council where Dustin lives).The end product will be a website and a mobile app to be experienced in the park, and an exhibition at Hackney Museum. 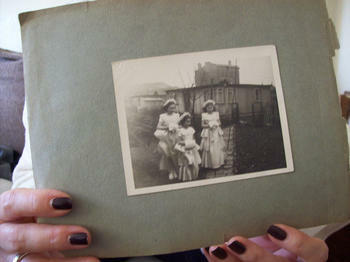 The collection and finished site will then become part of the official Hackney Archives collection. He's also hoping to install an original prefab home in the park, to act as an exhibition space for the project, and then be open as cultural center for ongoing activity, for a year or two after the project. Oh, and Dustin has a baby on the way!